Companies say that they build green homes when they choose to use responsible sourcing and sustainable practices for the actual building of the home itself. This goes all the way back to the point where they are cutting down the trees for lumber. Green homes are built using materials that are sustainable and using practices that ensure there is a minimal negative effect on the environment. For instance, choosing to use bamboo flooring materials rather than rosewood is a great decision. The green home label refers specifically to how the house was built in the first place but does not necessarily tell you anything about how efficient the home will be once you move in. By contrast, an energy efficient home is a home that is built to help reduce the amount of energy consumed by the inhabitants. This means things like extra insulation, proper ventilation, Low-E window glass, appliances, etc. 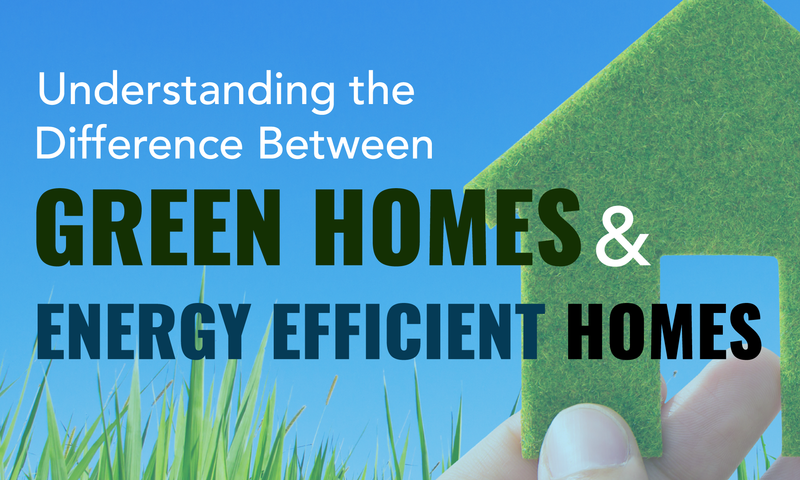 All of these factors contribute to the overall efficiency and heat transfer rate of the home. Even a home that is built using green practices could be very inefficient if the manufacturer is not careful. Likewise, there are plenty of very efficient homes that have been built using non-green practices. Usually, when you see energy efficient homes advertised, the manufacturer will put the efficiency rating of the home into financial terms. They will tell you how much you could be saving each month on your power bill by taking advantage of the efficient features they have built into their home. For many consumers, this monthly savings suggestion is quite influential and outweighs concerns over whether or not the house was built using green methods. As you can see, these two labels actually operate independently of one another and do not always coincide. Fortunately, most home manufacturers are aware that both elements are important to the customer in the long run, and they try to build homes that offer a good compromise between green living and energy efficiency so that customers get the best of both worlds. In fact, there's no reason that green materials can't be used to build more energy efficient homes if that is what the consumer wants. It is also important to note that we have many systems for rating the energy efficiency of a home, but we do not have many standards for green building. As a result, you're likely to recognize things like Energy Star stamps of approval, which tell you that the home is very efficient, but you are unlikely to see a stamp or sticker that denotes the home as being built using green methods. Some companies are now implementing their own programs for green building to let the customer know about the benefits of going green. Now that you understand how these two keywords are used for manufactured homes, you can search for your very own green and/ or energy efficient home. Make sure you ask your manufacturer or retailer about their products, so you can choose the right home for you.